To become a member and access the members only information, please complete the following form. Your account will become active once we receive your payment and your application is approved by the VADR Inc. Committee. Please select a username and password that you will be able to remember, as you will need these details to access the member's only files. How did you hear about VADR Inc? So that we can best serve our members, it is helpful to have the following information from new members. Would you be interested in assisting VADR Inc. in some way? What area(s) would interest you? 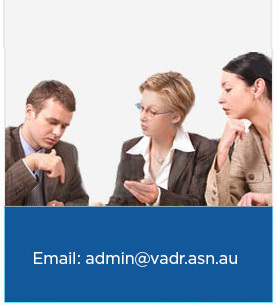 Occasionally VADR Inc. receives requests for referral of ADR accredited practitioners. Would you like to be placed on our referral list?